The New PCLinuxOS Magazine, which comprises volunteers from the PCLinuxOS community is proud to announce the release of it's July 2009 edition. This edition brought forth several decisions from the new crew to bring it forth to a monthly release and the selection of a new Chief Editor, Paul Arnote aka parnote. The magazine is released under the Creative Commons Attribution-NonCommercial-Share Alike 3.0 Unported license and by downloading, you acknowledge and accept this license agreement. Graphic File Formats Comparison and more! 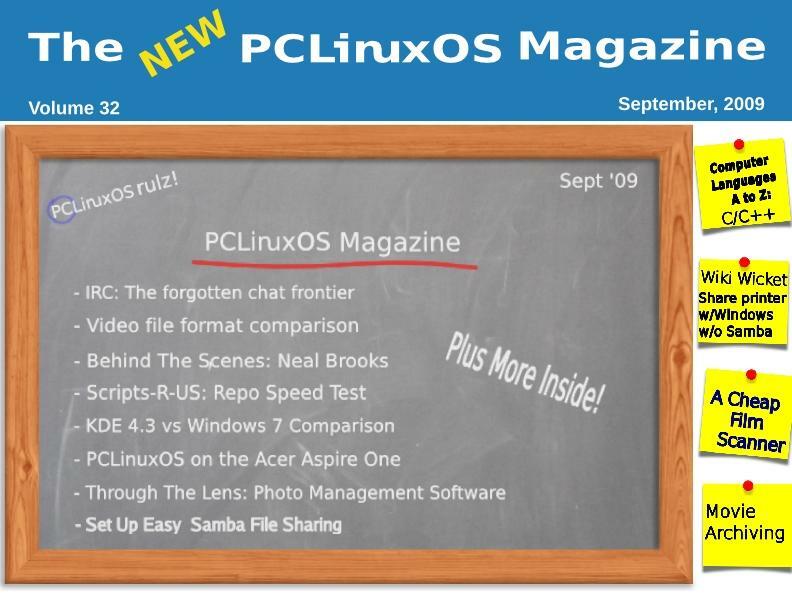 The New PCLinuxOS Magazine, which comprises volunteers from the PCLinuxOS community, is proud to announce the release of it's August 2009 edition. This edition continues the magazine crew's commitment to a monthly release schedule for the magazine. The magazine is also pleased to announce that Andrew Strick (Stricktoo) has accepted the position of PCLinuxOS Magazine Assistant Editor. This month's cover celebrates the "Back To School" time of year, and was created by Timeth, a member of the PCLinuxOS Beautificaiton Team. The NEW PCLinuxOS Magazine is created monthly for the PCLinuxOS community, by volunteer members of the PCLinuxOS community. The magazine is lead by Paul Arnote, Chief Editor and Andrew Strick, Assistant Editor. The NEW PCLinuxOS Magazine is created under a Creative Commons Attribution-NonCommercial-Share Alike 3.0 Unported License and by downloading, you acknowledge and accept this license agreement. Download size: 6.7 MB. The NEW PCLinuxOS Magazine staff is pleased to announce the release of the October 2009 issue of the PCLinuxOS Magazine. The NEW PCLinuxOS Magazine is a product of the PCLinuxOS community, published by volunteers from the community. The magazine is lead by Paul Arnote, Chief Editor, and Andrew Strick, Assistant Editor. The NEW PCLinuxOS Magazine is released under the Creative Commons Attribution-NonCommercial-Share-Alike 3.0 Unported license, and some rights are reserved. 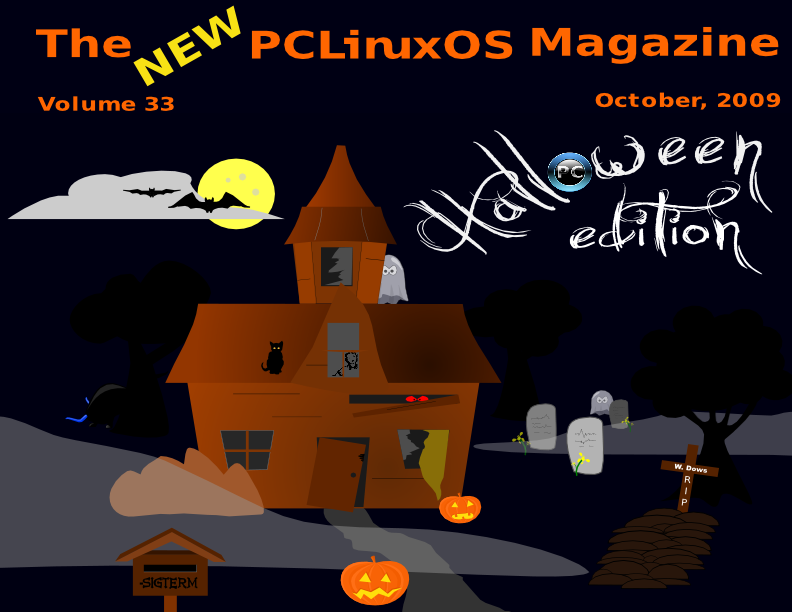 This month's cover celebrates Halloween, and was created by Timeth, a member of the PCLinuxOS Beautificaiton Team. Απλά μίας και υπάρχουν άτομα που δεν γνωρίσουν Αγγλικά θα σου είναι εύκολο να μεταφράσεις τα κείμενα να τα διαβάσει κάποιος και εάν τον ενδιαφέρει τότε μπορούμε να βοηθήσουμε και εμείς με τα Αγγλικά . The NEW PCLinuxOS Magazine staff is pleased to announce the release of the November 2009 issue of the PCLinuxOS Magazine. The NEW PCLinuxOS Magazine is a product of the PCLinuxOS community, published by volunteers from the community. The magazine is lead by Paul Arnote, Chief Editor, and Andrew Strick, Assistant Editor. The NEW PCLinuxOS Magazine is released under the Creative Commons Attribution-NonCommercial-Share-Alike 3.0 Unported license, and some rights are reserved. This month's cover celebrates the American holiday of Thanksgiving, and was created by Timeth, a member of the PCLinuxOS Beautificaiton Team. linuxman έγραψε: Πολύ καλό νέο . The NEW PCLinuxOS Magazine staff is pleased to announce the release of the December 2009 issue of the PCLinuxOS Magazine. The NEW PCLinuxOS Magazine is a product of the PCLinuxOS community, published by volunteers from the community. The magazine is lead by Paul Arnote, Chief Editor, and Andrew Strick, Assistant Editor. The NEW PCLinuxOS Magazine is released under the Creative Commons Attribution-NonCommercial-Share-Alike 3.0 Unported license, and some rights are reserved. Wireless USB: The Next Frontier? This month's cover celebrates the spirit of the winter holiday season, and was created by Timeth, a member of the PCLinuxOS Beautificaiton Team. The NEW PCLinuxOS Magazine staff is pleased to announce the release of the January 2010 issue of the PCLinuxOS Magazine. The NEW PCLinuxOS Magazine is a product of the PCLinuxOS community, published by volunteers from the community. The magazine is lead by Paul Arnote, Chief Editor, and Andrew Strick, Assistant Editor. The NEW PCLinuxOS Magazine is released under the Creative Commons Attribution-NonCommercial-Share-Alike 3.0 Unported license, and some rights are reserved. This month's cover features snowy winter pictures captured by magazine staff member ms_meme. The NEW PCLinuxOS Magazine staff is pleased to announce the release of the February 2010 issue of the PCLinuxOS Magazine. The NEW PCLinuxOS Magazine is a product of the PCLinuxOS community, published by volunteers from the community. The magazine is lead by Paul Arnote, Chief Editor, and Andrew Strick, Assistant Editor. The NEW PCLinuxOS Magazine is released under the Creative Commons Attribution-NonCommercial-Share-Alike 3.0 Unported license, and some rights are reserved. KDE 4: Konqueror or Dolphin? This month's cover features a photo of candy hearts by Paul Arnote, Chief Editor, to celebrate St. Valentine's Day. The NEW PCLinuxOS Magazine staff is pleased to announce the release of the March 2010 issue of the PCLinuxOS Magazine. The NEW PCLinuxOS Magazine is a product of the PCLinuxOS community, published by volunteers from the community. The magazine is lead by Paul Arnote, Chief Editor, and Andrew Strick, Assistant Editor. The NEW PCLinuxOS Magazine is released under the Creative Commons Attribution-NonCommercial-Share-Alike 3.0 Unported license, and some rights are reserved. This month's cover features Tux the Lucky Leprechaun, from magazine staff member ms_meme. The NEW PCLinuxOS Magazine staff is pleased to announce the release of the April 2010 issue of the PCLinuxOS Magazine. The NEW PCLinuxOS Magazine is a product of the PCLinuxOS community, published by volunteers from the community. The magazine is lead by Paul Arnote, Chief Editor, and Andrew Strick, Assistant Editor. The NEW PCLinuxOS Magazine is released under the Creative Commons Attribution-NonCommercial-Share-Alike 3.0 Unported license, and some rights are reserved. This month's cover features ms_meme's artwork from ms_meme's neighborhood, on the PCLinuxOS Forum. The NEW PCLinuxOS Magazine staff is pleased to announce the release of the May 2010 issue of the PCLinuxOS Magazine. The NEW PCLinuxOS Magazine is a product of the PCLinuxOS community, published by volunteers from the community. The magazine is lead by Paul Arnote, Chief Editor, and Andrew Strick, Assistant Editor. The NEW PCLinuxOS Magazine is released under the Creative Commons Attribution-NonCommercial-Share-Alike 3.0 Unported license, and some rights are reserved. April Showers Bring ... 9 New ISO's! This month's cover features artwork from Timeth, reflecting the various flavors of PCLinuxOS. The NEW PCLinuxOS Magazine staff is pleased to announce the release of the June 2010 issue of the PCLinuxOS Magazine. The NEW PCLinuxOS Magazine is a product of the PCLinuxOS community, published by volunteers from the community. The magazine is lead by Paul Arnote, Chief Editor, and Andrew Strick, Assistant Editor. The NEW PCLinuxOS Magazine is released under the Creative Commons Attribution-NonCommercial-Share-Alike 3.0 Unported license, and some rights are reserved. How Can YOU Contribute To PCLinuxOS? This month's cover features artwork from Timeth, and literally places Phoenix, the Xfce remaster of PCLinuxOS, in the spotlight. The NEW PCLinuxOS Magazine staff is pleased to announce the release of the July 2010 issue of the PCLinuxOS Magazine. The NEW PCLinuxOS Magazine is a product of the PCLinuxOS community, published by volunteers from the community. The magazine is lead by Paul Arnote, Chief Editor, and Andrew Strick, Assistant Editor. The NEW PCLinuxOS Magazine is released under the Creative Commons Attribution-NonCommercial-Share-Alike 3.0 Unported license, and some rights are reserved. This month's cover features artwork from Timeth, and celebrates World Population Day.